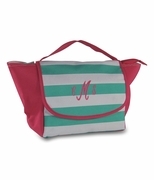 OUT OF STOCK...For the trendy woman, monogram starburst lunch tote bag. It’s the attention to detail that makes all the difference in this exquisite piece. 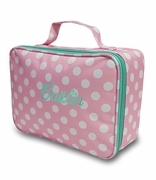 A lunch tote has never looked so cool! The striking Bohemian design of starburst medallions is enhanced by bold deep coral, turquoise on a black background. Perfect to match your outgoing and free-spirited personality. Use it to carry your designer sandwiches and a drink for lunch at the office. Lightweight for a day outing to hold treats and snacks. Makes a great gift idea for a friend. Embroidered lunch box measures 7.5”H x 9.5"W x 6 inches across the bottom. Includes name, single or three letter monogram.